1. Life has no pleasure higher or nobler than that of friendship. 2. Those who would gladly pass their days together may be separated by the different course of their affairs; and friendship, like love, is destroyed by long absence, though it may be increased by short intermissions. 3. Such are the arts by which cheerfulness us promoted, and sometimes friendship established; arts which those who despise them should not rigorously blame, except when they are practised at the expense of innocence; for it is always necessary to be loved, but not always necessary to be reverenced. 4. The feeling of friendship is like that of being comfortably filled with roast beef; love, like being enlivened with champagne. 5. The joy of life is variety; the tenderest love requires to be renewed by intervals of absence. 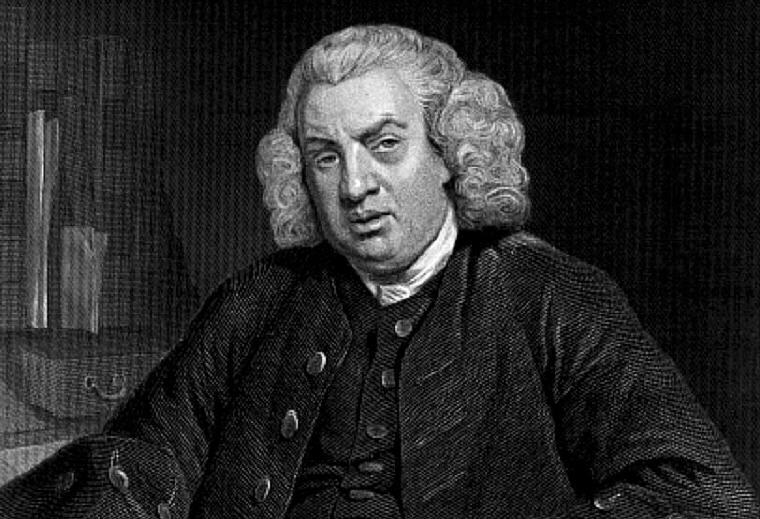 Excerpt from Wikipedia: Samuel Johnson (18 September 1709 – 13 December 1784), often referred to as Dr Johnson, was an English writer who made lasting contributions to English literature as a poet, essayist, moralist, literary critic, biographer, editor and lexicographer. Johnson was a devout Anglican and committed Tory, and has been described as “arguably the most distinguished man of letters in English history”. He is also the subject of “the most famous single work of biographical art in the whole of literature”: James Boswell’s Life of Samuel Johnson. 1. Curiosity is, in great and generous minds, the first passion and the last; and perhaps always predominates in proportion to the strength of the contemplative faculties. 2. Few things are impossible to diligence and skill. 3. As it is necessary not to invite robbery by supineness, so it is our duty not to suppress tenderness by suspicion; it is better to suffer wrong than to do it, and happier to be sometimes cheated than not to trust. 4. … allow them [children] to be happy their own way, for what better way will they ever find? 5. Learn, that the present hour alone is man’s. 6. What we hope ever to do with ease we may learn first to do with diligence. 7. Yet it is necessary to hope, though hope should always be deluded, for hope itself is happiness, and its frustrations, however frequent, are yet less dreadful than its extinction. 8. It is always observable that silence propagates itself, and that the longer talk has been suspended, the more difficult it is to find any thing to say. 9. If a man does not make new acquaintance as he advances through life, he will soon find himself left alone. A man, Sir, should keep his friendship in constant repair. 10. Getting money is not all a man’s business: to cultivate kindness is a valuable part of the business of life. 11. Self-confidence is the first requisite to great undertakings. 12. We are inclined to believe those whom we do not know, because they have never deceived us. 13. A wise man will make haste to forgive, because he knows the true value of time, and will not suffer it to pass away in unnecessary pain. 14. Pleasure is very seldom found where it is sought. Our brightest blazes of gladness are commonly kindled by unexpected sparks. The flowers which scatter their odours from time to time in the paths of life, grow up without culture from seeds scattered by chance. Nothing is more hopeless than a scheme of merriment. 15. Every man is rich or poor according to the proportion between his desires and his enjoyments; any enlargement of wishes is therefore equally destructive to happiness with the diminution of possession, and he that teaches another to long for what he never shall obtain is no less an enemy to his quiet than if he had robbed him of part of his patrimony. 16. No oppression is so heavy or lasting as that which is inflicted by the perversion and exorbitance of legal authority. 17. To convince any man against his will is hard, but to please him against his will is justly pronounced by Dryden to be above the reach of human abilities. 18. Hope is necessary in every condition. The miseries of poverty, of sickness, or captivity, would, without this comfort, be insupportable; nor does it appear that the happiest lot of terrestrial existence can set us above the want of this general blessing; or that life, when the gifts of nature and of fortune are accumulated upon it, would not still be wretched, were it not elevated and delighted by the expectation of some new possession, of some enjoyment yet behind, by which the wish shall at last be satisfied, and the heart filled up to its utmost extent. 19. My dear friend, clear your mind of cant. You may talk as other people do. 20. But actions are visible, though motives are secret. 21. In order that all men may be taught to speak truth, it is necessary that all likewise should learn to hear it; for no species of falsehood is more frequent than flattery, to which the coward is betrayed by fear, the dependent by interest, and the friend by tenderness: those who are neither servile nor timorous are yet desirous to bestow pleasure; and, while unjust demands of praise continue to be made, there will always be some whom hope, fear, or kindness will dispose to pay them. 22. Great works are performed not by strength, but perseverance; yonder palace was raised by single stones, yet you see its height and spaciousness. He that shall walk with vigour three hours a day, will pass in seven years a space equal to the circumference of the globe. 23. He that would pass the latter part of life with honour and decency, must, when he is young, consider that he shall one day be old; and remember, when he is old, that he has once been young. 24. Nothing will ever be attempted if all possible objections must be first overcome. 25. The use of travelling is to regulate imagination by reality, and instead of thinking how things may be, to see them as they are. 26. Curiosity is the thirst of the soul; it inflames and torments us, and makes us taste every thing with joy, however otherwise insipid, by which it may be quenched. 27. Hope is itself a species of happiness, and, perhaps, the chief happiness which this world affords; but, like all other pleasures immoderately enjoyed, the excesses of hope must be expiated by pain; and expectations improperly indulged must end in disappointment. 28. Integrity without knowledge is weak and useless, and knowledge without integrity is dangerous and dreadful. 36. As I know more of mankind I expect less of them, and am ready now to call a man a good man upon easier terms than I was formerly.